Recent research just announced by Bristol University (England, UK) indicates that children whose parents encourage early communication are better at talking by the age of two and get along better when they start school. Using data about 9,629 children in the Children of the 90s study (ALSPAC) at the University of Bristol, the research found that those children whose parents provided a rich 'communications environment' went on to achieve higher scores on tests of language, reading and maths when they entered school. In other words - by encouraging reading, talking and playing, providing a range of books and toys, visiting libraries, restricting TV time and taking their child to preschool, parents can dramatically improve their child's language skills and readiness for school. The effect of this early communication on children has been found to be so significant that the "communication environment" was a better predictor of children's success with language than their social background. This is more evidence to support the idea - which many people have long accepted - that what parents do with their children, even before they have begun to talk and regardless of their social background, can help to prepare children for school.
" These findings are an encouragement to all parents to provide a positive communication environment for their child from the very start of their lives. _The project did identify particular aspects of the communication environment, like having children's books around and not having the television on too much. But the main message is that, as parents, we can have an impact on how our children learn to talk by providing a range of communication experiences. _And the better our children are at talking by the age of two years, the better they will do when they start school." Throughout 2011, NHS Bristol, Bristol City Council, North Bristol NHS Trust and other partners are supporting the 'Hello' campaign, organised nationally by The Communication Trust to increase understanding of how important it is for children and young people to develop good communication skills.
" This research will help us promote language development with children's centres and schools in Bristol. Positive communication right from babyhood is the key to good communication later on." " Although we recognise that traditional indicators of social risk such as material wealth remain influential later on, what you do with your child and how you communicate with them when they're under two is far more important than having a flash car or a detached house in the country. _This is a very positive message as it gets us away from the belief that a child's educational future is pre-determined by standard measures of socio-economic disadvantage such as income, housing or the mother's education. _Social disadvantage is often measured by parental income or education but this doesn't tell us how parent choose to spend their time or money. Simple activities such as visiting a library more often, playing simple games together or joining a Surestart group can help improve a child's communication skills immensely." This project was led by Professor Sue Roulstone, Underwood Trust Professor of Language and Communication Impairment at the University of the West of England in collaboration with Professor Tim Peters from the University of Bristol, Professor James Law, from Newcastle University, Dr Robert Rush from the University of Edinburgh and Dr Judy Clegg from the University of Sheffield and funded by the Department for Education. 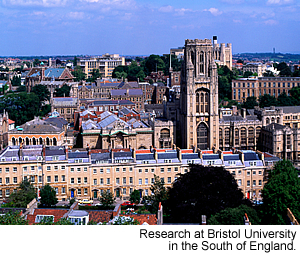 Based at the University of Bristol, Children of the 90s is known the world over. It is a long-term health research project that enrolled more than 14,000 pregnant women in 1991 and 1992. It has been following the health and development of the mothers and their children in great detail ever since. Health News is included on the IvyRose website to inform visitors about current health issues and research, but not to endorse any particular view or activity. Any views expressed in the article above are not necessarily those of IvyRose Ltd.. Material in this news item was released by the source indicated below on 30 June 2011 and may have been edited (e.g. in style, length, and/or for ease of understanding by our international readers) for inclusion here. For further information, please visit their website.